Select from our private simulator hire package options below and you will receive a quote via email. We recommend enquiring at least two weeks in advance. The latest you can book is 1 week in advance. If you have any special requests please include them in the Additional Notes. If you are flexible and/or if you are considering any other dates please let us know in the Additional Notes. 1-hour private simulator sessions are for up to 16 people. If you have more people in your group you may have to upgrade to the 2-hours session. If numbers are slightly different let us know in the Additional Notes. 2-hours private simulator sessions are for up to 32 people. Your group may need to split in two and while some are flying the rest can enjoy the exhibition. If you have slightly different numbers let us know in the Additional Notes. Please enter a number less than or equal to 32. This is the name of your team or booking which will be displayed on the Departures’ Screen. Private Flight Simulator sessions offer an exclusive, fun and informative experience. 1-hour sessions can be shared by up to 16 people. If you have more people in your group or wish to fly for more time, you can select the 2-hours experience. When everyone arrives, we welcome you to the exhibition and lead you to the simulators, where you will get to fly an Airbus A380 and a Boeing 777. The experience also includes a Landing Competition! Everyone is encouraged to participate, and at the end, we announce the results, awarding the best pilots with certificates from the Aviation Experience. Make your experience even more special and memorable by offering prizes to the winners of your competition or offer everyone a souvenir picture from the A380 cockpit. 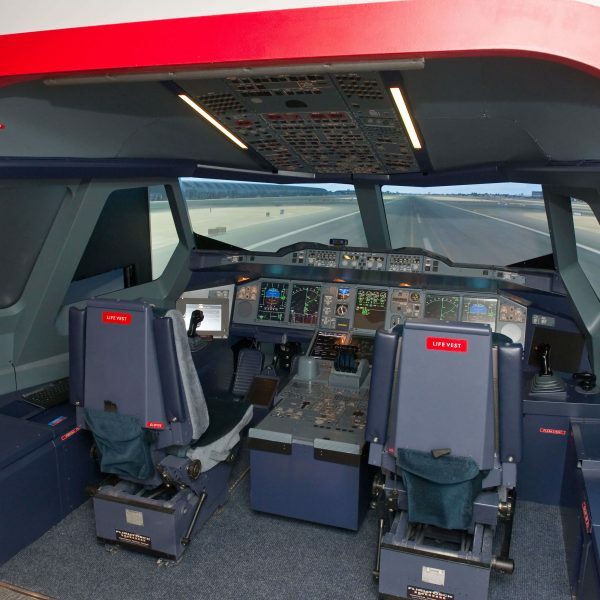 Private Flight Simulator sessions offer an exclusive, fun and informative experience, on board our four simulators; two Airbus A380’s and two Boeing 777’s. 2-hour sessions can be shared by up to 32 people. When you arrive, we welcome you into our exhibition and split your group into two. The first group is lead into the flight simulators, and the second group explores the exhibition. While the first group is flying, the second group can also go on board the Emirates Air Line cable car for a private return journey over the river Thames. After an hour, we rotate the groups. The simulators experience is perfect for beginners. Our instructors will give you an introduction and guide you throughout the session. You will form teams of pilots and co-pilots, and practice your flying skills, take-offs and landings. There are ten destinations to choose from, as well as different weather conditions and times of day. The experience also includes a Landing Competition! Everyone is encouraged to participate, and at the end of both sessions, we all gather to announce the results, awarding the 3 best pilots or best teams with certificates from the Aviation Experience. Make your experience even more special and memorable by offering prizes to the winners of the competition, or offer everyone a souvenir picture from the A380 cockpit. Below are our main prize packages to award your 3 best pilots for your competition. If you wish to have a custom package let us know in the Additional Notes. Products are subject to availability and may be substituted with similar priced items. For the ultimate team experience, also select to award the co-pilots. Are you sure you don't wish to include any prizes for the competition? Don't miss out to an amazing ending to your event! You can also make your own packages, just let us know in the additional notes. For an unforgettable event, offer your guests photo souvenirs from the A380 cockpit at 40% off! Photos are £3.00 each and come in our Aviation Experience wallets. Relax with your group before or after your Simulator Experience with food and drinks at our Café. The Air Lounge Table includes a wide selection of vegetarian and meat sandwiches and baguettes with crisps, desserts and soft drinks (£12.00 per person). Premium menu also includes meat and vegetable skewers, premium desserts and drinks (£18.00 per person). Served during opening hours. Please include dietary requirements in the additional notes. You can as well choose to offer your team hot drinks and pastries at our Cafe, upon arrival or after your simulator experience (£6.00 per person). Hire a cabin (up to 10 people) for a private return journey plus skip the queues service and a souvenir wallet. Or for more flexibility, get individual return tickets. A return journey is around 15 minutes. 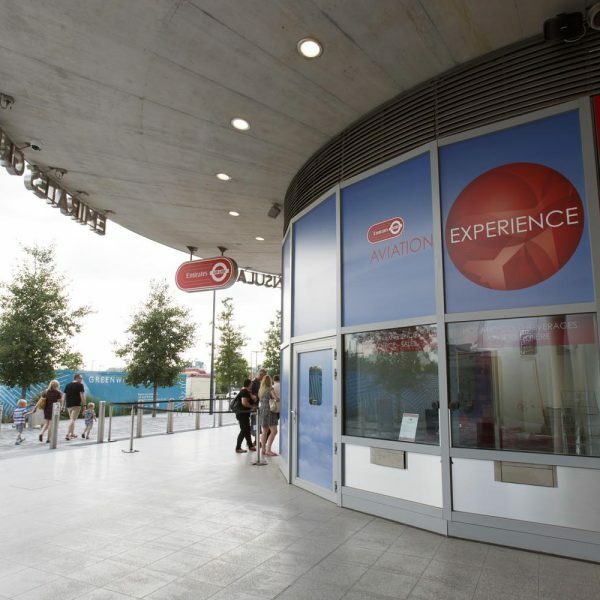 The North Greenwich terminal is right next to our exhibition. A private cabin can fit up to 10 people. Make sure you select enough to fit your group. On which venue listing website did you find us? Which other venue listing website did you use? All personal details shared with The Emirates Aviation Experience will ONLY be used for the purposes of your enquiry and potential booking. We don't share personal details with any third party companies. I am over 16 and agree to the storage and handling of my data by this website.